The large scale, contemporary botanical print wallcovering in designer Bridgit Wilson's dining room is from Cole & Son, a British company that's more than a hundred years old and specializes in hand-printed papers. 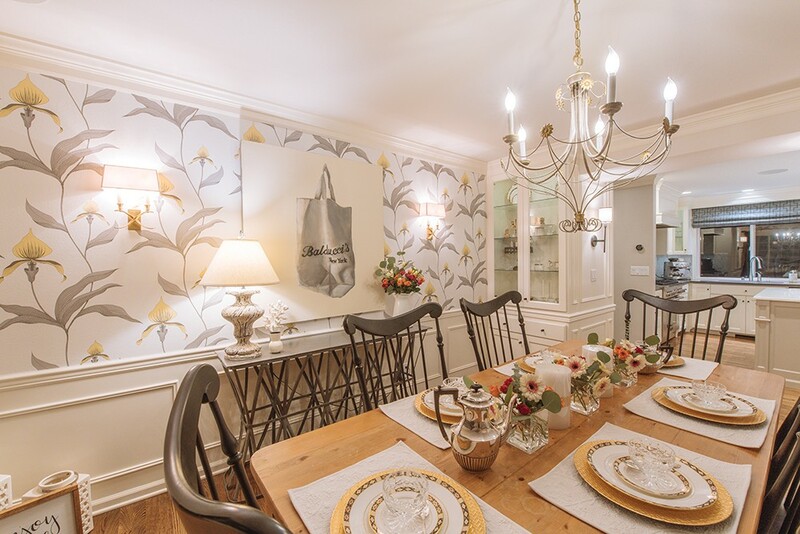 Wallpaper is back and stealing the hearts of designers and homeowners alike. The once popular, then taboo, design treatment has flooded mainstream trends and is quickly transforming rooms — and unexpected places — with texture, retro patterns, bold florals and abstract images. "Wallpaper is still a small percent of our overall projects, but it has come back huge in the last three years," says Traci Magers, interior designer at Wallflowers Design Center. "No matter what people think they can do with paint, with wallpaper you can do so much more. It can transform a room like nothing else can, offering dimension and a personal touch." The possibilities are endless — just look at Pinterest. Whether your home is new modern, midcentury modern, or turn-of-the-century, there's always room for wallpaper. While the architectural style or period of your home can be used to guide the design direction, there are no hard and fast rules to live by. Wallpaper can assist in creating ambiance in a dining room or used to create a dramatic statement wall behind the headboard in a master bedroom. Use it on expansive blank walls without any windows, or cover a powder room from floor-to-ceiling in a bold, whimsical print. "Wallpaper is coming back for a reason," says Bridgit Wilson, interior designer and owner of Nook Interiors. "It's an investment that totally transforms a room. Some wallpaper really looks like artwork — it's just stunning." Not ready to update the walls of your house? There are many creative ways to use wallpaper. It can be used to line open cabinets, drawers, bookshelves or hutches. It can be framed like a piece of art, used on the ceiling to add a splash of color, or used to cover the top of dining and end tables. Wallpaper can even transform a staircase by using paper on the stair risers or can turn an ordinary walk-in closet into a glamorous dressing room. Whether your style is retro, modern, rustic or traditional, there's a wallpaper pattern or texture to complement your home. Choose from classic 100-year-old French patterns, big bold florals, whimsical 1960s patterns or geometric shapes. "Wallpaper just adds life to the walls," says Wilson. "If you like bold patterns, you'll always like bold patterns. But if you're terrified by patterns, adding texture like grasscloth or woven silk will envelop a room better than any paint color." Magers couldn't agree more. "Physical textures give a room dimension, warmth and a tactile touch," she says. "Texture never goes out of style. Any natural fiber — materials like cork, jute or bamboo — will withstand the test of time." So you've picked a pattern or texture and the perfect remodel project. Thinking of installing the wallpaper yourself? Think again. "Unless you're really confident, you don't want to spend the money on the paper and then ruin it while trying to hang it," says Traci Magers of Wallflowers. "I always recommend hiring a professional installer," adds interior designer Bridgit Wilson. "They are experts at their job, because there's really an art to it. Professionals can accurately calculate how much wallpaper you're going to need — which is its own beast — and apply it right the first time." The original print version of this article was headlined "Wallcovering Comeback"